The exclusive apartments' gulls Kieker "was completely renovated in December, 2015. 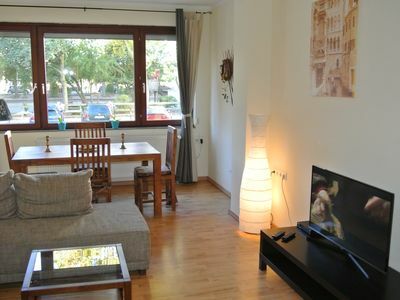 The tourists will find a charming, individually furnished apartment with 2 bedrooms. The spacious layout can accommodate up to 6 people. 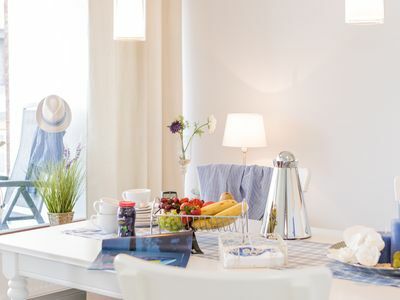 The short distance to the beach and in the pedestrian zone Scharbeutzer (Café Important and Gosch) and an indoor pool and sauna in the residence make the apartment a real insider tip. 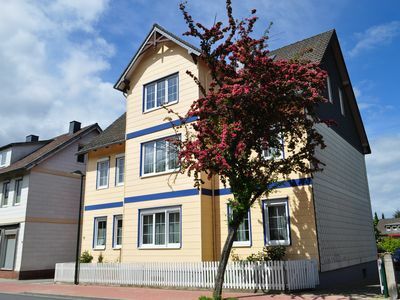 Individually, generous and charming, the Apartment "Seagulls Kieker" welcomes you. Diners enjoy a spacious living room with integrated dining room. The white maritime design makes for a unique Baltic flair. The large window units and the upstream balcony flood the entire space with light and emphasize the warm atmosphere throughout the apartment. Flat-screen TV, a modern music system with radio and CD player guests will find a large comfortable sofa bed in the living area. Here there is relaxing to sleep 2 more people. 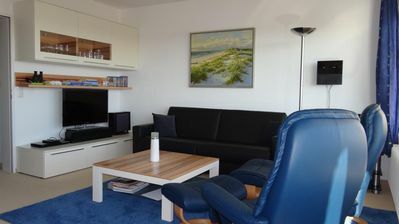 The mattress is 1.40 mx 2.00 m.
Naturally, the apartment "seagulls Kieker" the guests a free wi-fi connection and a cordless telephone (free calls to German. Landline). The modern light-filled kitchen is in a separate room with a private balcony. Facilities In addition to the basic cooking utensils includes a dishwasher, ceramic hob, oven, large fridge with 4 * freezer, microwave, coffee machine, toaster and crockery for 12 people. As a further highlight, the apartment offers 2 separate bedrooms. 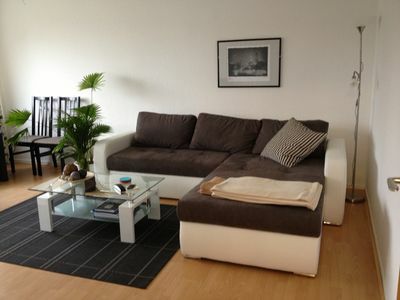 Total found including the sofa bed in the living room 6 people comfortable sleep in the apartment. The first bedroom convinced by the spacious layout. The double bed has a deck area of ​​1.60 x 2.00 m and has a large wardrobe with plenty of storage space. 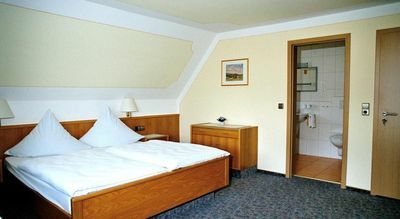 Two bedside consoles and a flat-screen TV provide sufficient comfort. In the second bedroom guests will find a stable bunk bed 2.00m in size depending 0,90m x. This is especially suitable for children, but of course can also be used by adults. The modern, nautical-themed bathroom offers its guests in addition to a very spacious rainforest shower (0,90m x 1,00m) and a spacious vanity area with base cabinet. Next convinced the bathroom with a mirror cabinet and a separate vanity mirror. A hair dryer and a drying rack is of course also the basic equipment. 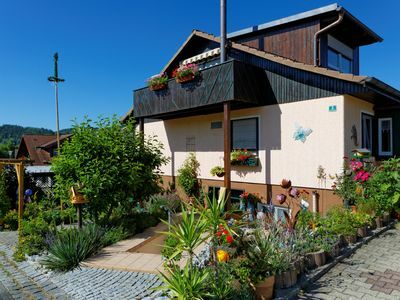 From the living room you reach the large balcony (south-west location) with a view of the beautiful nature of Scharbeutzer hinterland. Here you can relax from noon to night and enjoy the sun. Grilling with electric grill makes the evening a cozy experience. From the kitchen and the bedroom you can reach the second balcony of the apartment. 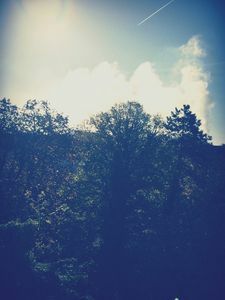 Enjoy here the morning sun and recharge your energy for the day. We attach great importance to relaxation and wellbeing. Therefore, guests will find a separate indoor pool with counter current system in the house of the apartment. The 5,00m x 10,00m large pool is free all year round usable by the guests and has a comfortable temperature of 26 degrees. In addition, located in the hotel spa area includes a Finnish sauna (This is currently being renovated and can not be genutz!). Also this is selbstvständlich all year round for all guests. Please note here that the use of the sauna is subject to charges. Even the welfare of our little guests is close to our heart. 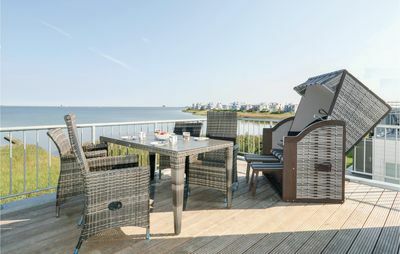 The apartment "seagulls Kieker" has therefore to request 2 high chairs (baby high chair & Triptrapstuhl) and a foldable baby bed with comfortable mattress. 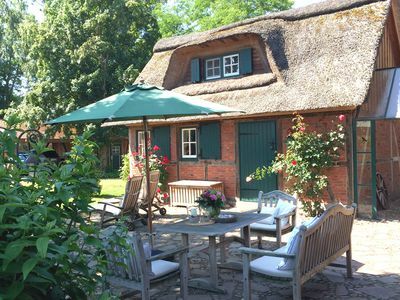 Our manager on site will be happy to help in case of questions while on leave in Scharbeutz.